Product code: W593 Categories: Sold Omega Watches, Sold Watches. 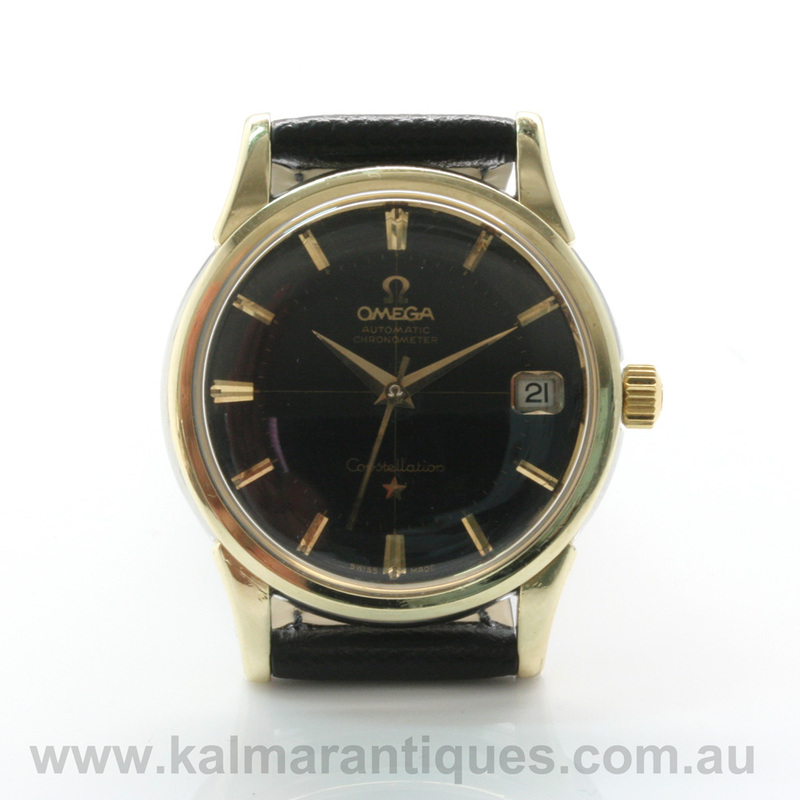 The highest grade movements from Omega always go into the Omega Constellation and here is a highly sought after and all original black dial 1961 Omega Constellation Pie Pan. The pie pan dial is so called as the side of the dial has twelve angled sides to it and is arguably the most sought after of all dials. Not only is this dial the most sought after, but it is the black dial and is all original and has not been repainted. So many black dial watches deteriorate over the years and get repainted as a result so it is wonderful to find a black dial Omega Constellation that has not been touched. On a side note, when you look at the centre of the watch in the main image, you will see the Omega logo that came out in the photography but in reality is quite hard to see. This is actually on the Omega crystal to show that it is an original Omega crystal and not a generic one. The case measures 34mm across plus the Omega Constellation crown and is in stainless steel with the 14ct gold capped bezel. The colour of the bezel combined with the gold coloured index markers set on the black dial really make this Omega look so elegant and stand out day or night as a classic Omega watch. Fitted on an Omega band and buckle, inside is a 24 jewelled automatic Omega calibre 561 that has been serviced by Omega, runs perfect and comes with our twelve month warranty. Fitted on an Omega band and buckle, this vintage Omega Constellation is just perfect and so handsome no matter where or when it will be worn.